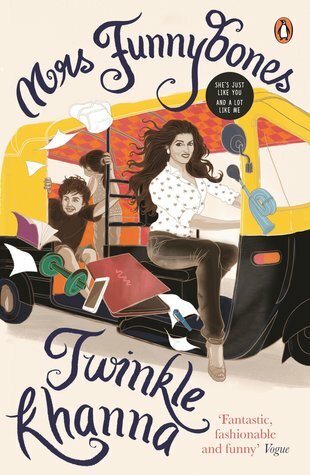 Mrs. Funnybones by Twinkle Khanna is author's debut book. She was a Bollywood actor, married to Akshay Kumar, a famous personality in Indian cinema. The author is an Interior designer, blogger, and a mother of two kids. This is not an autobiography. It's about the daily life incidents which are presented in a very humorous way. She refers to her husband as a man of the house, her elder kid as a prodigal son, and then there's a baby girl. She also talks about her dog and mother, Dimple Kapadia. She includes her mother-in-law and her neighbors incident as well. Twinkle Khanna is a blogger, and people convinced her to write a book. So this book gives a feeling to readers that they read a blog. But the content is fascinating. It questions the old age Indian tradition, the festivals we celebrate, the neighbor's everyone has to deal with, the political approach, and most important what the author feels about God, and what happened when you say in your mind without any filters. There is not a dull moment in this book. The story is fast-paced and finished in an hour or two. It is one of the best books I have ever read. I laugh out loud on a few episodes. Twinkle Khanna was fat as a child, and her mother buys clothes for a fourteen-year-old when she was just seven. She used to eat mangoes sitting on the potty. This book makes anyone laugh. She talks about how her mother embarrasses her in front of everyone. The way her prodigal son fell in love, and it gives the author an ultimate shock. The kids got martial-art skills in their genes from the man of the house, Akshay Kumar, and how they use it on the poor author especially the baby. The only problem I have with this book is that it is short, and the readers don't know about the year of all the mentioned incidents. If you hope to find about Bollywood gossips, then you are wrong. The author strictly sticks to her life as a mother, wife, and an entrepreneur. The events have single POV, and sometimes I felt that the author must include the man of the house POV as well to get a better understanding. I really like the title, and cover page of the book. Overall, I love this book. It's highly recommendable. From the book - "Why do women have longer lifespans? Is it because we express ourselves all the time, thus reducing stress? Or are the men just trying to die earlier to escape the incessant chatter?" "Mom says she hates festivals, wants to drink beer, ride her yellow scooter, and run over random people who burst crackers." Full of wit and delicious observations, Mrs. Funnybones captures the life of the modern Indian woman - a woman who organizes dinner each evening, even as she goes to work all day, who runs her own life but has to listen to her Mummyji, who worries about her weight and the state of the country. Based on Twinkle Khanna's super-hit column, Mrs. Funnybones marks the debut of one of our funniest, most original voices.